Computers were designed to work primarily with English. The problem is that many of us wish to input other languages into the computer. This is possible by switching keyboards (not the physical keyboard) on the computer. In this overview we give details of how to use Microsoft and Keyman keyboards. Microsoft keyboards are probably preferable to use if you wish to input text in one of the languages for which they have supplied a keyboard. 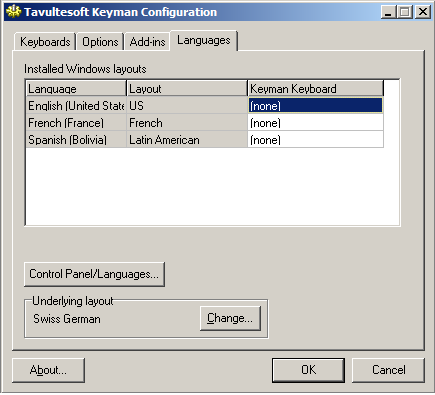 If you need a keyboard for some other language, or you do not like Microsoft's layout, you may want to use a keyboard manager like Tavultesoft's Keyman. Keyman allows you to create your own customized keyboard, or if you choose, you may use a Keyman keyboard someone else has created. Instructions are given here for installing Microsoft keyboards as well as Keyman keyboards. Microsoft provides numerous Unicode keyboards as part of their operating system language support. These have to be selected and installed individually. You may need your Windows installation CD for this. The keyboard layouts are not provided on the CD, but are available on the Internet. Next you will select a language and keyboard. There may be several keyboards available for a given language. You can install as many as you want. Go to Start / Settings / Control Panel / Regional Options. You should already be at the General tab. Select the language you want to enable. You may need your Windows installation CD for this step. Follow the installation instructions. Next, on the Input Locales tab, click Change... and Add... (you can add multiple layouts for a given locale). Then choose a keyboard from the list and click OK .
Show the Language bar on the desktop). Click Apply and OK . There are several options depending on your needs. Choose one and follow the steps. Once you have the Visual keyboard open, you can either type using keys or just mouse click on each key and it will insert the character you clicked on - in whatever app you have open at the time. If you want the keyboard layout on your local machine you can download the Microsoft Visual Keyboard for Office 2000 at: http://www.microsoft.com/downloads/details.aspx?FamilyID=86a21cba-e9f6-41db-86eb-2adfe407e620&DisplayLang=en. Instructions for installation are at the site. 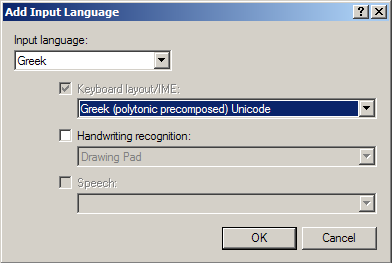 Windows 98/ME keyboards are all codepage-based - they supply 8-bit data that, for Unicode-based apps, must be translated to Unicode via a codepage. There are languages, such as the Indic ones, that are not implemented via any codepages. 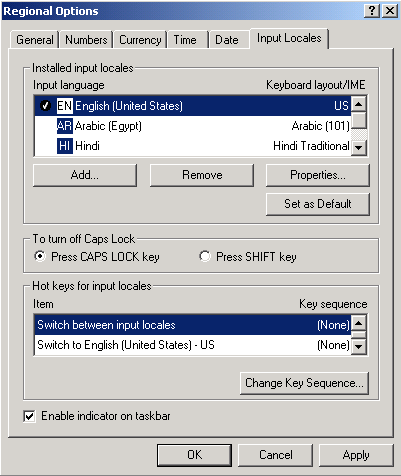 This means it is impossible to obtain a keyboard for these languages that works in Win98/ME. Even considering just the set of codepage-based languages that Microsoft supports, Win98/ME do not come with a complete set of keyboards. Especially, Western editions do not come with any RTL language keyboards (Arabic, Hebrew) or CJK (Chinese, Japanese, Korean) because these scripts are not supported at the system level. However, there are applications that have full RTL and CJK support, e.g., Office and Internet Explorer. So if you want to respond to a web-based form in Arabic, you need an Arabic keyboard, and if you want to write Arabic text in a Word document, you need a keyboard - but you'll find you cannot add them from Control Panel because they aren't supplied with the system. In Internet Explorer, click Tools / Windows Update. If not already selected, choose Product Updates (on the left side of the window). You will be asked "Do you want to install and run 'Windows Update Control Package'". Click yes . You'll have to wait a bit for a list of installable components to be generated. Look down the list for the section titled INTERNATIONAL LANGUAGE SUPPORT and then look for Arabic Language Support or Japanese Input Method, or whatever you want. Check the appropriate boxes and click on the Download button. 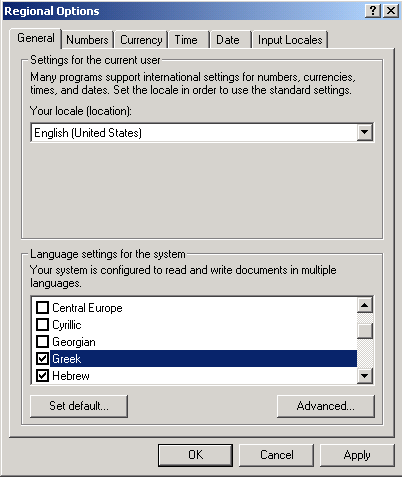 Go to Control Panel / Add/Remove Programs, pick Microsoft Internet Explorer, click Add/Remove, select Add a Component, scroll to near the bottom of the list to the section titled "Multi-Language Support" and select Arabic Text Support, Korean Text Input Support, etc., as needed, then click Next . IE will only show up in Add/Remove Programs if you have installed a version of IE. It will not show up if your current version of IE is what came on your computer. After completing either (a) or (b), then you use Control Panel as described above to add the desired language. In order for your language to have proper behavior in Office documents, you will need to add your language for Office use. This will allow spell checking, etc for your language. Before installing a keyboard, you must make sure the language is installed on your system. Go to Start / Programs / Microsoft Office Tools / Microsoft Office Language Settings. If not already enabled, checkmark the languages you wish to install. Follow the directions on the screen and restart your computer when it asks you to. Before installing a keyboard, you must make sure the language is enabled on your system. Go to Start / Programs / Microsoft Office Tools / Microsoft Office XP Language Settings. Highlight the language you wish to enable. Click on Add and then OK . Follow the directions on the screen and restart your computer when it asks you to. Before installing a keyboard, you must make sure the language is enabled on your system. 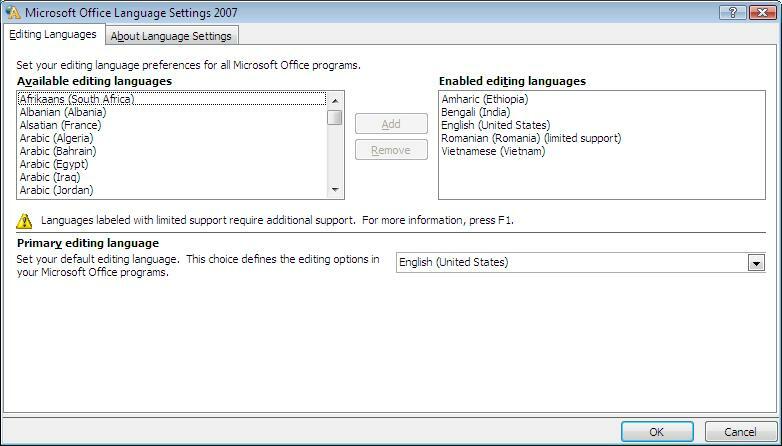 Go to Start / Programs / Microsoft Office / Microsoft Office Tools / Microsoft Office 2007 Language Settings. Highlight the language you wish to enable. Keyman is a keyboard management utility that makes it practical to input many different languages in almost any Windows application. Keyman fully supports Unicode, as well as legacy codepage-based applications. Keyman includes features such as an on-screen keyboard, phonetic and visual-order input methods, and seamless integration with the Windows XP Language Bar. 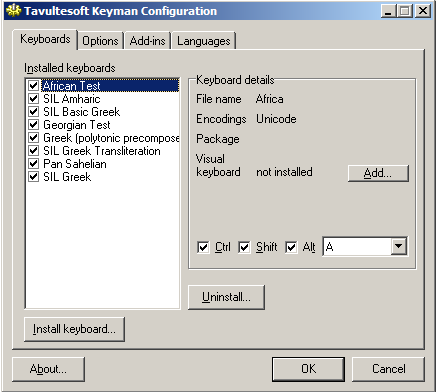 Keyman is developed and supported by Tavultesoft. If you will be writing or modifying keyboards, you will need the Developer version. Otherwise, get the regular version. Uninstall any previous versions of Keyman. Make sure you are signed on to your computer with administrative privileges. Go to the Tavultesoft page and download Keyman Developer 6.0. Double-click on the file you downloaded. Follow the installation instructions. When it asks if you want to install the runtime version, click Yes . Run Start / Programs / Tavultesoft Keyman / Keyman. This will install the Keyman driver. Run Start / Programs / Tavultesoft Keyman Developer / TIKE. Click on the Register Now... button. Follow the instructions for registering. Right click the Keyman icon, and click Start with Windows if you want Keyman to be available each time you start up. Keyman keyboards use the extension .kmx. In the instructions we will use the name foo.kmx to represent your keyboard. Install your keyboard by double-clicking the keyboard file foo.kmx. Then click Install to install the keyboard file. Install your keyboard by right-clicking the Keyman icon on your system tray. Click the Install Keyboard button. Browse to the location of the file foo.kmx. Click foo.kmx to select it. Then click Open , choose a hotkey (one is already selected for you but you may choose another one or choose none), then Install . You should get a message saying the keyboard was installed successfully. 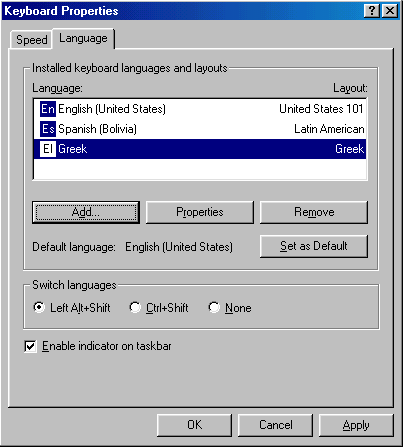 Click OK and OK .
To work with a keyboard in Windows XP, you should associate it with a language. This can be done through the Keyman Configuration dialog box. 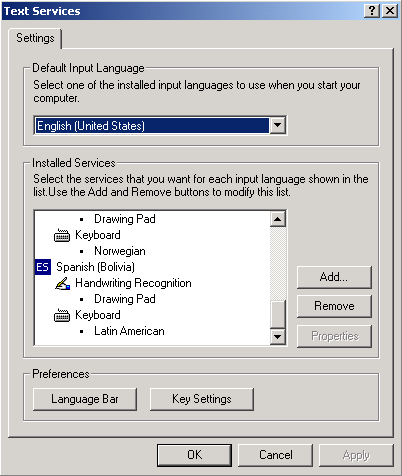 Follow the instructions for Text Services and Input Languages settings. 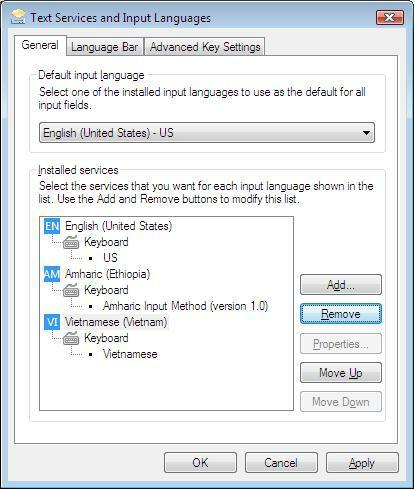 If not already installed, select the language for the keyboard or the nearest equivalent. The language you choose should have the same codepage as your keyboard (normally U.S. English or 1252). An additional tip is that if your keyboard is for a language that Microsoft does not have a keyboard, you should choose a language for which the Proofing Tools are not installed. 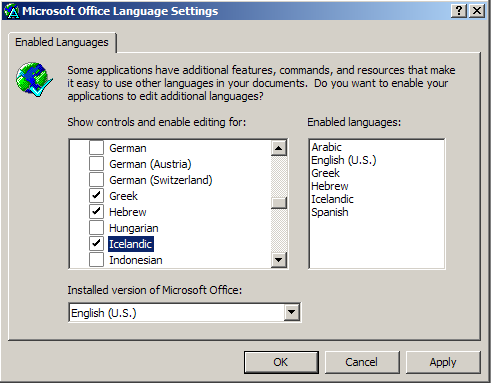 When you switch languages in an Office program, it looks to see if it has proofing tools for that language. If there aren’t any, Office turns off proofing for all text in that language. Otherwise, you may have red and green squiggly lines under your data. Since you did the steps in this section, you may skip the next section. Use this step if you do not have Office XP installed on your computer. If you do have Office XP installed, you should use the previous step. 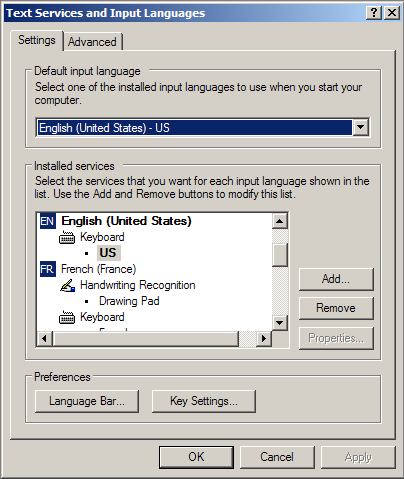 To work with a keyboard in Windows, you should associate it with a language in Start / Programs / Microsoft Office Tools / Microsoft Office Language Settings. 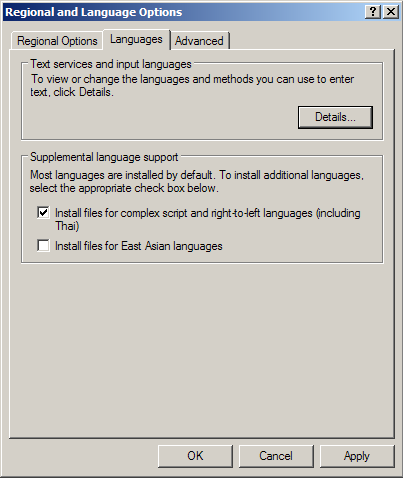 If not already installed, select the language for the keyboard or the nearest equivalent. The language you choose should have the same codepage as your keyboard (normally U.S. English or 1252). An additional tip is that if your keyboard is for a language that Microsoft does not have a keyboard, you should choose a language for which the Proofing Tools are not installed. 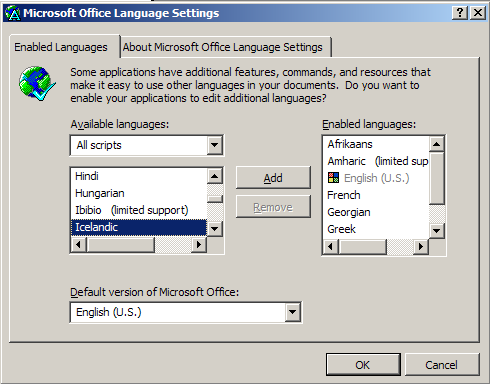 When you switch languages in an Office program, it looks to see if it has proofing tools for that language. If there aren’t any, Office turns off proofing for all text in that language. Otherwise, you may have red and green squiggly lines under your data. Follow the directions on the screen. You can delay restarting until finishing these installation instructions. The legacy Keyman IPA93 keyboard was created assuming codepage 1252, so it can be associated with any of the following languages. These all have a default legacy codepage of 1252. This list is from “Appendix F Locale-Specific Code Page Information” on Microsoft’s website (apparently no longer available). This is particularly important when running an application like Microsoft Word on Win9x/ME. These understand Unicode but can run in an 8-bit context. Go to Start / Settings / Control Panel / Regional Options / Input Locales. Either Add your keyboard or highlight the language for your keyboard or its nearest equivalent and change its Properties. You can have more than one locale per language. Set the Input Locale to your language and the keyboard to foo. Click OK / Apply / OK . Once you have the Keyman keyboard associated with your language, you should switch it on and off only using the input locale icon. You shouldn't use the Keyman icon. Close the Control Panel window. To use the keyboard, go to your application, set the font to a Unicode font which contains the Unicode range you need. Click the language icon on your system tray ('EN' for English) and select your keyboard. Begin typing. The keyboard layout should be described in the documentation folder of the font package. Go to Start / Settings / Control Panel / Regional and Language Options. Select the Languages tab, then the Details... button. If not already installed, you will need to add your language. Click Add . Set the Input Language to the language you have chosen and the keyboard to (foo). Click OK / OK . Once you have the Keyman keyboard associated with your language, you should switch it on and off only using the Language Bar icon. You shouldn't use the Keyman icon. From the Text Services window, you will also need to turn off keyboard switching. Click Key Settings . 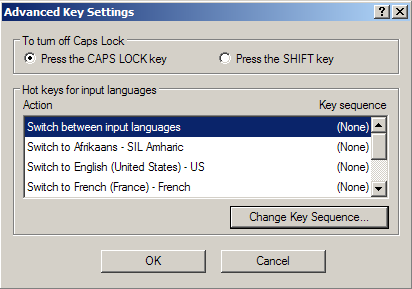 Click Change Key Sequence while "Switch between input languages" is highlighted. Uncheck both boxes or set so that only one is on and uses CTRL, not Left ALT. Click OK and OK . You may have to reset this often, since Windows seems to have trouble remembering and will frequently go back to the default of using Left ALT. The default setting will interfere with any keyboard that defines Alt-Shift in combination with any key. You may install more than one keyboard for a given language. For instance, you can assign more than one keyboard to Hebrew, or add a keyboard to a language which also has a system keyboard. If a language has multiple keyboards assigned, you will see a small 'keyboard' icon appear in the system tray when you select that language. Click it and select the keyboard you wish to use. To use the keyboard, go to your application, set the font to a Unicode font which contains the Unicode range you need. Click the language icon on your system tray ('EN' for English) and select your language. Then click the small 'keyboard' icon and select the keyboard "foo". Begin typing. The keyboard layout should be described in the documentation folder of the font package. Because the design of keyboards is a matter of preference, SIL has not included Keyman keyboards with the Doulos SIL package, but there are numerous Keyman keyboards in existence. SIL does not endorse or provide support for these. The contact address at the website should be used for any user support.